We face a future of increasingly subtle and sophisticated threat factors; a world where traditional clues and indicators are no longer enough on their own to identify and block attacks; where information is wielded as a weapon, misdirection is king, and global networks of connected devices can be used to paralyse the Internet. What does this mean for business in 2017? Kaspersky Lab UK's Principal Security Researcher, David Emm, shall present the Who, What, How and Why in Kaspersky Lab's predictions for 2017 and explain how they will affect the cyber-security landscape throughout the year. - Who: The business sectors we predict will be particularly targeted in 2017 and who will attack them. - What: The data, behaviour and habits that will expose businesses to increasingly sophisticated threat factors. - How: The technical methods through which businesses will be targeted. 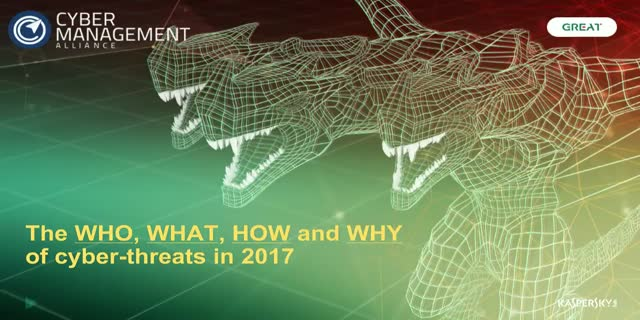 - Why: What Kaspersky predict to be the endgame of 2017's cyber-criminals.